If you’re into sports, you need to come visit Dr. Aaron to gain that competitive edge! Dr. Aaron is a Certified Chiropractic Sports Physician®. 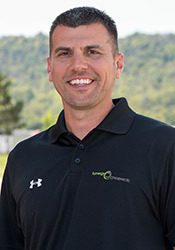 As a CCSP®, he is trained in the evaluation and care of sports and extremity related health issues for athletes and those needing help with hard to heal injuries. As a sports enthusiast and athlete himself, Dr. Aaron is passionate about helping other athletes get back in the game, heal and prevent future injuries. We see a variety of high school, collegiate and child athletes prevent and heal from injuries through chiropractic care. Gain the edge over your competition with a healthy, aligned spine and joints. We can help prevent injuries of the ankles, knees, hips, shoulders and elbows. We can also help you heal faster. Kinesio taping is just one of many ways to help you heal quickly! To learn more about how Dr. Aaron can help you through chiropractic care, contact us today and arrange a time to visit.